Though it is still premature, all signs point to a broad and wide-carried victory for Jair Bolsonaro in Brazil’s presidential run-off vote today with some 60%. With neighbouring Colombia also on the right-wing track under President Iván Duque Márquez, many analysts are left to wonder whether the whole South American continent could now be on its way towards conservativism after decades of left-wing rule. Earlier this month, Chilean President Sebastian Pinera declared at an economic forum in Madrid that presidential candidate Bolsonaro was "on the right economic track." And although many in Argentina are still reeling from a plunging value of their currently, Foreign Minister Jorge Faurie commented that "Brazilians have freely exercised their democratic rights and have chosen the future rather than the past." 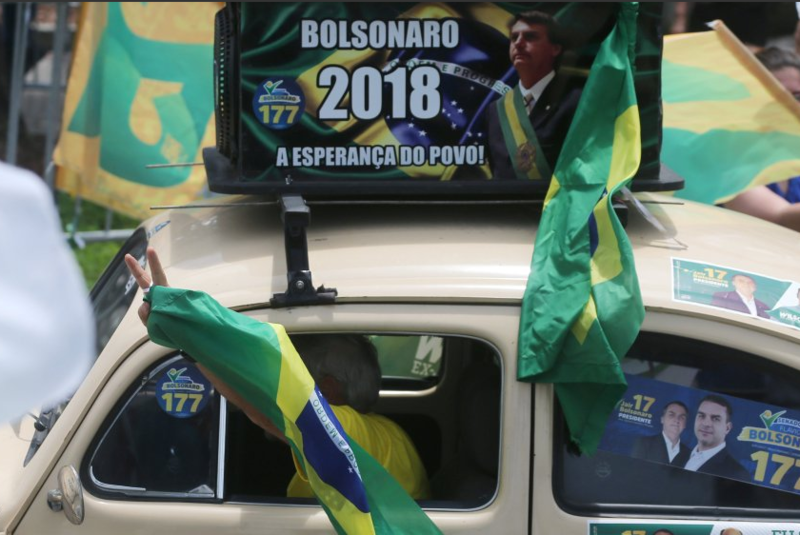 Related coverage: <a href="https://thegoldwater.com/news/40487-Brazil-Election-Agony-To-Become-Left-Wing-Apocalypse"> Brazil Election Agony To Become Left-Wing Apocalypse?</a>. The conservative governments of Macri in Argentina, Pinera in Chile, Duque in Colombia and probably as from tomorrow Bolsonaro in Brazil, means more bad news for Venezuela’s left-wing dictator Mr Nicolas Maduro, who stands more and more isolated and only has Bolivia and Cuba as staunch allies left. Furthermore, political analysts in Brazil also point to the trend to explain the public’s disdain for a continued rule by the left-wing PT or Workers’ Party, whom many claim is responsible for the greatest economic recession in Brazil’s recent history. Anything is better than continued corruption goes their logic. Mr Michael Klein, head of the German Konrad Adenauer Foundation in Chile, agrees. He stated that: "Democracy thrives on change.". "The changes in power in Latin America should not be a surprise, especially since left-wing governments' hold on power lasted for more than 15 years." Mr Bolsonaro stands to be elected having copied the election program of US President Donald Trump. Whereas he was also despised in the mainstream media, with newspaper editors painting him as far-right, many journalists failed to interpret the public’s anger over three consecutive failed presidencies of the left-wing PT. Brazilians agree therefore that Bolsonaro may not be perfect, but anything is better than a continued left-wing rule.